From Carnegie Award winning author Sarah Crossan, a poetic and timely immigration story that combines first love, friendship, and persistent courage. Carrying just a suitcase and an old laundry bag filled with clothes, Kasienka and her mother are immigrating to England from Poland. Kasienka isn't the happiest girl in the world; at home, her mother is suffering from a broken heart as she searches for Kasienka's father, and at school, Kasienka is having trouble making friends. The only time she feels comforted is when she's swimming at the pool. But she can't quite shake the feeling that she's sinking. Until a new boy swims into her life, and she learns that there might be more than one way to stay afloat. 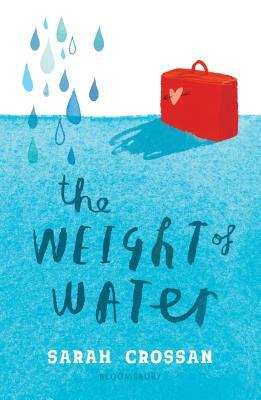 The Weight of Water is a coming-of-age story that deftly handles issues of immigration, alienation, and first love. Moving and poetically rendered, this novel in verse is the story of a young girl whose determination to find out who she is prevails. Sarah Crossan is originally from Dublin. She graduated with a degree in philosophy and literature before training as an English and drama teacher at Cambridge University and has been working to promote creative writing in schools since. She taught English at a small private school near New York until she became a full time writer. She completed her Masters in creative writing at the University of Warwick in 2003 and in 2010 received an Edward Albee Fellowship for writing. Sarah lives in Hertfordshire with her husband and their daughter.